The rate of a reaction is the speed at which a reaction happens. 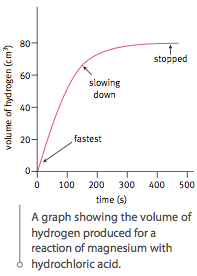 If a reaction has a low rate, that means the molecules combine at a slower speed than a reaction with a high rate. Some reactions take hundreds, maybe even thousands, of years while others can happen in less than one second. The rate of reaction depends on the type of molecules that are combining. Different reactions can happen at different rates. 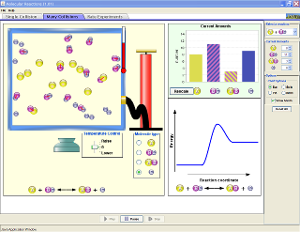 Reactions that occur slowly have a low rate of reaction. Reactions that happen quickly have a high rate of reaction. For example, rusting is a slow reaction: it has a low rate of reaction. 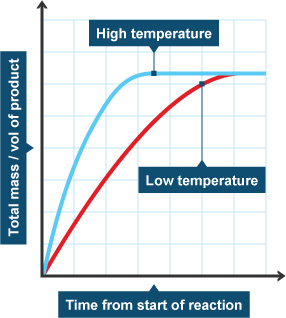 Burning and explosions are very fast reactions: they have a high rate of reaction. - For a chemical reaction to occur, the reactant particles must collide. But collisions with too little energy do not produce a reaction. 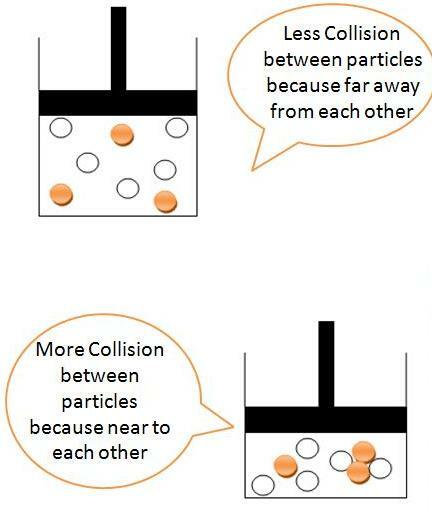 - The particles must have enough energy for the collision to be successful in producing a reaction. 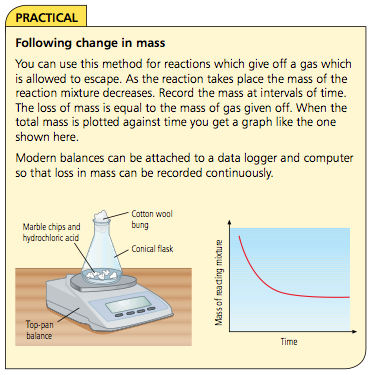 Calculating rate of reaction depends on measuring something which changes with time, for example: volume of gas, mass of the reaction mixture or amount of light transmitted through a solution. If there is more of a substance in a system, there is a greater chance that molecules will collide and speed up the rate of the reaction. If there is less of something, there will be fewer collisions and the reaction will probably happen at a slower speed. Sometimes when you are in a chemistry lab, you will add one solution to another. When you want the rate of reaction to be slower, you will add only a few drops at a time instead of the entire beaker. When you raise the temperature of a system, the molecules bounce around a lot more because they have more energy. When they bounce around more, they are more likely to collide. That fact means they are also more likely to combine. When you lower the temperature, the molecules are slower and collide less. That temperature drop lowers the rate of the reaction. Back to the chemistry lab! Sometimes you will mix solutions in ice so that the temperature of the system stays cold and the rate of reaction is slower. Surface area is the exposed matter of a solid substance. Imagine that you are holding a perfect cube of magnesium. The surface area is the sum of the area of all six sides of the cube. The surface area of the cube can be increased by dividing the cube into smaller cubes. 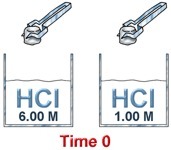 Surface area is maximized when a single large cube is crushed to fine powder. The rate of reaction of a solid substance is related to its surface area. 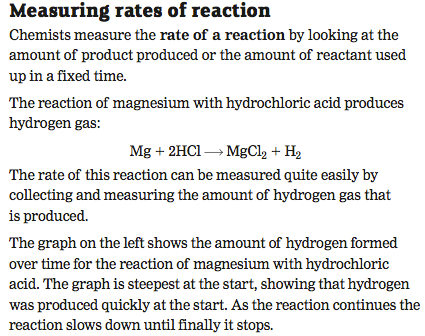 In a reaction between a solid and an aqueous/liquid/gas species, increasing the surface area of the solid-phase reactant increases the number of collisions per second and therefore increases the reaction rate. 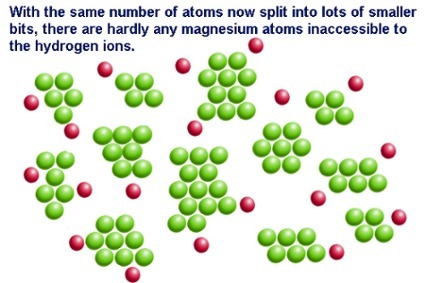 In a reaction between magnesium metal and hydrochloric acid, magnesium atoms must collide with the hydrogen ions. By increasing surface area, there are more collisions per unit of time. That's why many solids are powdered using a mortar and pestle before being used in a reaction. 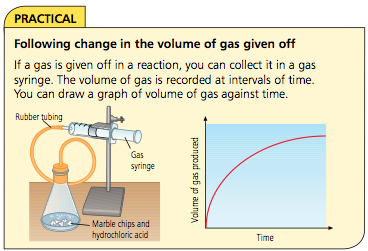 Pressure affects the rate of reaction, especially when you look at gases. When you increase the pressure, the molecules have less space in which they can move. 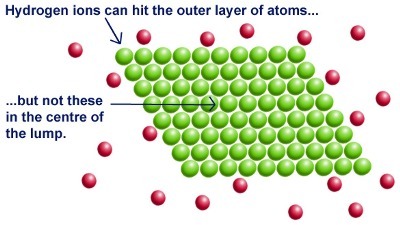 That greater density of molecules increases the number of collisions. When you decrease the pressure, molecules don't hit each other as often. 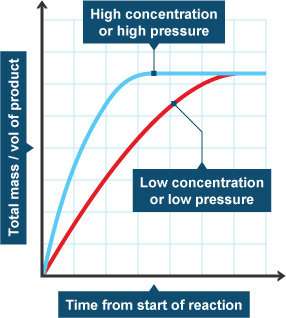 The lower pressure decreases the rate of reaction. A catalyst is a species that speeds up a chemical reaction without being chemically changed upon completion of the reaction. 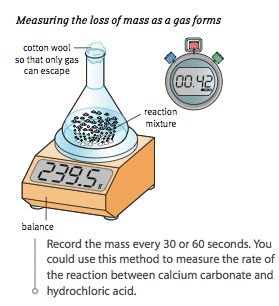 In other words, the mass of a catalyst is the same before and after a reaction occurs. 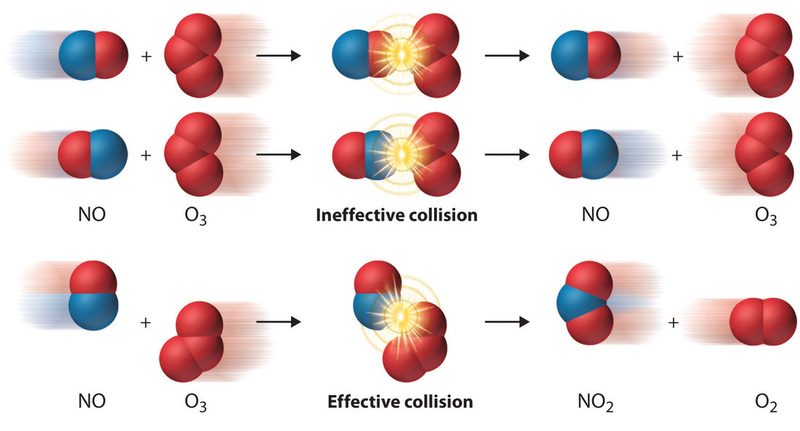 Recall that collisions only result in reactions if the particles collide with enough energy to get the reactions started (i.e. to overcome the activation energy barrier).